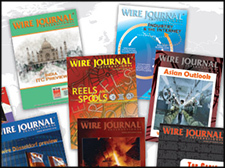 Wire Journal International (WJI) and WIRE BULLETIN welcome appropriate information for departments such as industry news, people, products, media, and calendar. E-mail submissions are preferred using the contact buttons below. Information can also be mailed to Wire Journal International, Attn: Editorial, 781 Bradley Road, Ste 9, Madison, CT 06443-2662. Please be specific and concise when sending information. Make sure that you provide the basic information (who, what, why, when, and where) for the item you wish to have published. Include a contact email address. If an item is newsworthy, we will make every effort to publish the information in a future issue. A print or electronic image (either color or black and white) can be sent to accompany a submission. Electronic images are preferred; they should be high-resolution (300 dpi) and sent in a jpg, tif or bmp file format. A print, slide, or disc will be returned if accompanied by a self-addressed, stamped envelope.